Andrew Moffitt M.B. Memorial Web Site: Online tribute honours slain student, Sunday 17 January 1999. City, The Ottawa Citizen Online. Online tribute honours slain student, Sunday 17 January 1999. City, The Ottawa Citizen Online. 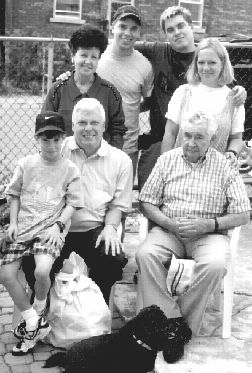 The Moffitt family portrait, posted on the Andy Moffitt memorial Web site, features, standing at back, left to right: Andy's mother Paulette, Andy with baseball cap, brother Rod, and Rod's fiancee Karen Visser. Seated at front, left to right: brother Michael, 11, father Rod Sr., and grandfather Adrien Beriault. Mr. Beriault's dog Elby, is at front. The two brothers Rod, left, and Andy, are in another photo posted on the site. The digital headstone created by Andy Moffitt's brother is a fitting memorial for a man who spent many hours on the Internet, Christopher Shulgan writes. Nestled amid the everyday chatter and brash commerce of the World Wide Web is a touching tribute to Andy Moffitt, the University of Ottawa student who was stabbed to death at a Somerset Street restaurant days before Christmas. The tribute, at www.memoriam.org, is the work of Andy's brother, Rod Moffitt. The Internet is often seen as an antiseptic, isolating medium, populated by lonely people made lonelier still by the time they spend in front of their computers. But the Internet in its original incarnation was supposed to connect people. The Moffitt family was an example of the way the medium should work. 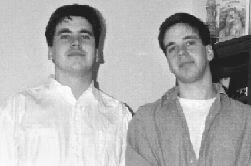 Before Andy's death, the three Moffitt brothers joked with each other over e-mail, struck up real-time conversations using high-tech software, and enjoyed elaborate, multi-player computer games together -- all over the Internet. Now, the remaining family members -- Rod in Ottawa, the rest of the family in Brockville -- are using it to deal with the grief of losing Andy. For Rod, 27, the Internet tribute stands as a sort of digital headstone for his brother. Memorializing loved ones online is a growing trend, but for Andy, the tribute is particularly fitting. For someone who spent hours online, an Internet tribute is as appropriate as a plaque at a baseball stadium in memory of a baseball player. "I tried to show what a wonderful person he was, to show the joy he had in life," said Rod, a computer programmer who works at Nortel in Ottawa. The Web page avoids the syrupy sentimentality that sympathy cards can sometimes descend to. Rod's tribute to his brother is personal and raw, and captures the tragedy of Andy's death in a compelling way. Having just completed his Christmas exams, the third-year computer engineering whiz was celebrating at Coyote's, a University of Ottawa hangout that was hopping with other post-exam revellers. A half-hour after midnight, one of Andy's friends intervened to help a bar manager who was tussling with a patron. Andy stepped in to aid his friend. The patron pulled a knife. Andy was stabbed in the heart. Within an hour, he was dead. Henry Danninger, a 26-year-old student at the university, has been charged with second-degree murder. He remains in police custody, and is expected to appear in court for a bail hearing this week. As a newborn, Andy had a heart irregularity; his doctors predicted he wouldn't live past his fourth day. Then, when he was 21, a virus attacked a muscle in his heart, and he suffered a heart attack. Despite these brushes with death, Andy's family says the strength of his heart was manifest in many acts of kindness: taking an ailing neighborhood boy to the hospital, mentoring his younger brother Michael, surprising his mother at her birthday party in December. His family finds a crushing irony in his fate. "One thing about Andy, even if he had problems with his heart, that was where he was strongest," said Rod. One way his older brother escapes the pain is by working on Andy's memorial page. The work makes him feel close to his brother, he says. Ever since Rod Moffitt Sr., a salesman for Christie Cookies, bought his two sons a TI-99 computer 16 years ago, the brothers shared a love for the technology. From the TI-99 they graduated to a Commodore 64, and from there on to ever more powerful computers. As young men, the Moffitt brothers worked successfully at Nortel on blindingly fast Linux work stations, programming telephone switches to run at their optimum capability. They spent hours playing Quake, a multi-player combat game, over the Net. They would "talk" online with the computer program ICQ, and collaborated and traded ideas for several of their Web pages, such as nuked.org or andymoffitt.org. Rod takes solace in knowing people throughout the world can surf through his brother's life. He says building the Web site has helped him deal with thoughts about all the people who would have met Andy, had he lived an average lifespan. Rod seems to find comfort in the idea that, just as mementos of Andy's life exist amid the seemingly infinite Internet, that makes it more certain that Andy's soul is somewhere amid the infinity of heaven. At memoriam.org, Internet surfers can scroll their way past smiling photos from the Moffitt family album, and read the many newspaper articles about Andy's death and funeral. As they read, Rod hopes they feel they are getting to know his brother. They also can read a letter from his mother, Paulette Moffitt. "Andy lives in our hearts forever," Ms. Moffitt writes. "It hurts so much right now. When the sun comes out and shines brightly, it reminds me of Andy. He loved the sun." The tribute is also a warning of how fragile life is, according to Rod. "See what happened to my brother?" goes the site's subtext. "Your life is fragile: Don't waste it." The two brothers had plans for professional collaborations. They intended to work as partners on a computer start-up one day, and in the days before Andy's death, made plans to discuss a commercial venture, an alternative to the online chat program ICQ, over a beer. "We never got a chance to do it," said Rod. "There was no limit to the ideas we had." Through memoriam.org, Rod also offers free Web site storage space to anyone who wants to put a digital headstone on line. His offer is unusual. There are many sites offering Web site storage space for online tributes for the dead, but most of them charge at least a nominal fee. Rod still is dealing with the grief of losing his brother. But he is coping -- helped by long drives with his father, and therapeutic hours working on Andy's Web page. In the days after Andy's death, Rod didn't think he would ever be able to play the computer game Quake again. But brother Mike, who shared a special bond with Andy, was talking to Rod recently. "He wanted to play really bad," Rod said. "So we played it.